Hi ya everyone! Today I'm sharing a simple card in which my paper did the work for me. This gorgeous paper from Simple Stories called, Simply Vintage Botanicals, set the whole tone and feel of my card today. I picked it up at 7 Kids Craft Store. 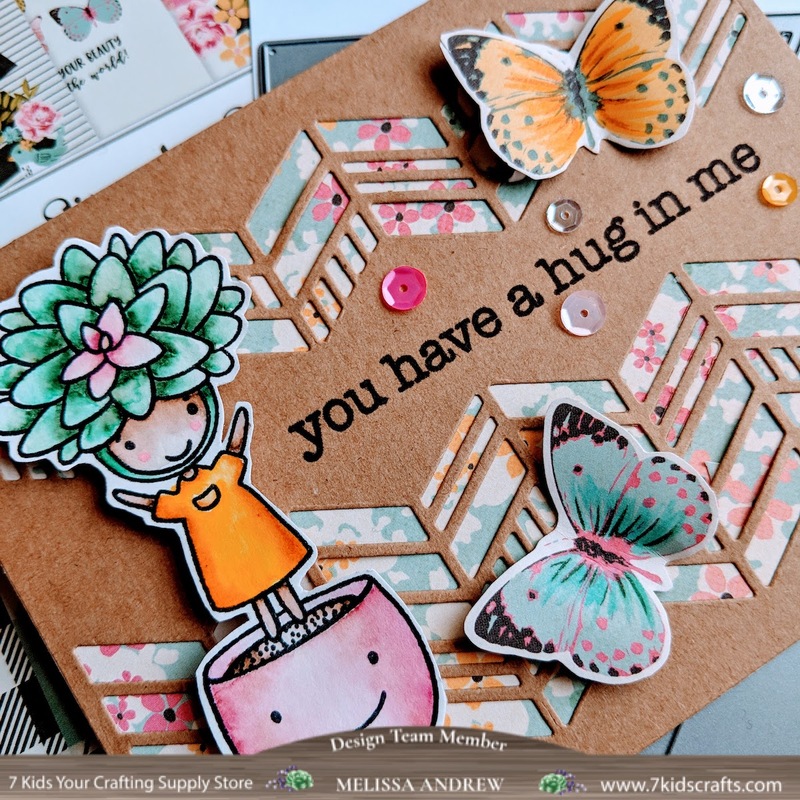 I did add a beautiful sentiment from Picket Fence Studios stamp set called You Are My Sunshine. I stamped it right onto the paper in Versafine Clair. I then colored the new little birds from Picket Fence Studios in my Copic markers, R00, R30, R20. I added Shimmer Stix Sparkle to them as well. I adhered them down to my paper with OnPoint Glue. Last I used some Nuvo Crystal Drops in Calm Aqua and placed them with some clear sequence. Then I was finished after mounting everything onto an A2 sized card. Seriously, paper did all the work! I love that. I hope you enjoyed simple card. You can find so many fabulous products at 7 Kids and this month you can get a number of Picket Fence Studio Stamps on sale as well as paper!!! What crafter doesn't love paper? Make sure to use the code PAPERHOARDING to save your 20%. Also, join us at 7 Kids Customer Create on Facebook for freebies, Live videos and lots of inspiration. Hi ya everyone! You are going to want to hurry and pick up the new mermaids at Sweet November from 7 Kids Craft. They are only there for a limited time (one week). Then they are gone again. This one, Hanalei, was so fun to color up with my Copic markers. I fussy cut her and added this sweet girl to a mixed media background. 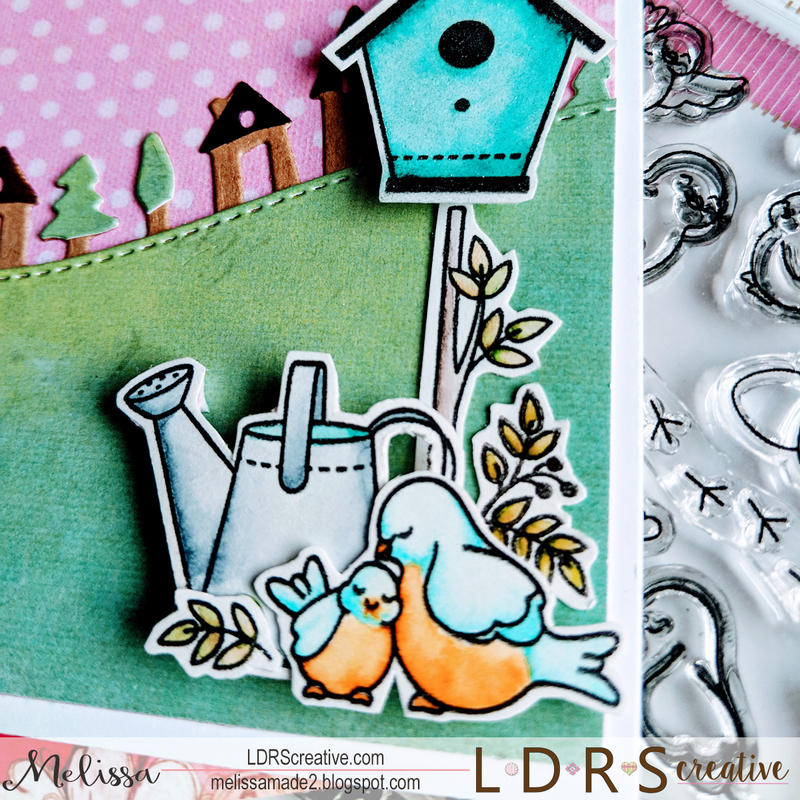 For the background I used a Whimsy die and stencil. I sprayed the background paper with Fireworks Spray and then added some white acrylic paint to the stencil. Next I cut a frame with a Whimsy die an added the scales with a silver acrylic paint. I then added the fun Crackle medium that Kelly has in the store. I also added blue bubbles in the background with the Prima pastes. 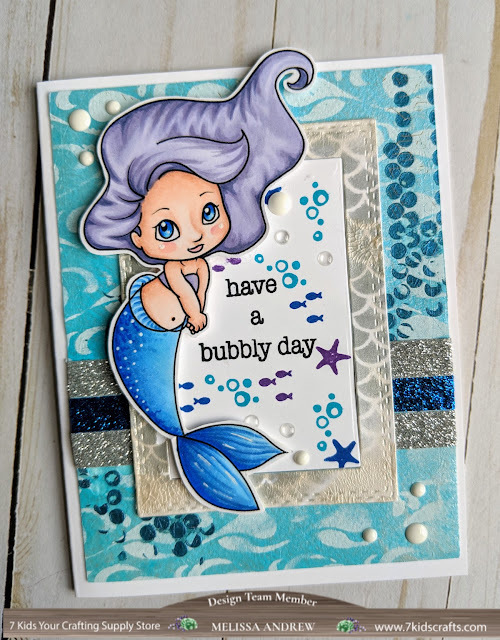 The sentiment is from Picket Fence Studios and so is the background bubbles, stars and fish! 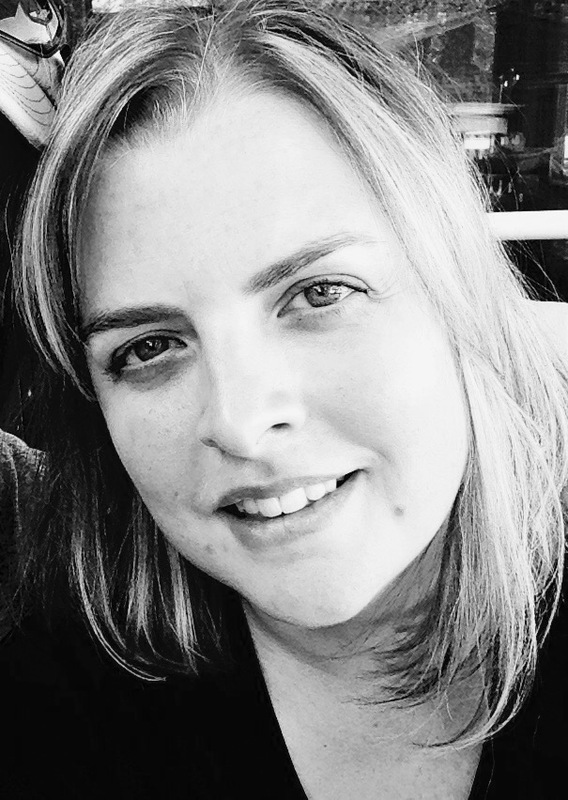 Join us at 7 Kids Customer Create for Live color alongs with the Sweet November creator Amy Young. 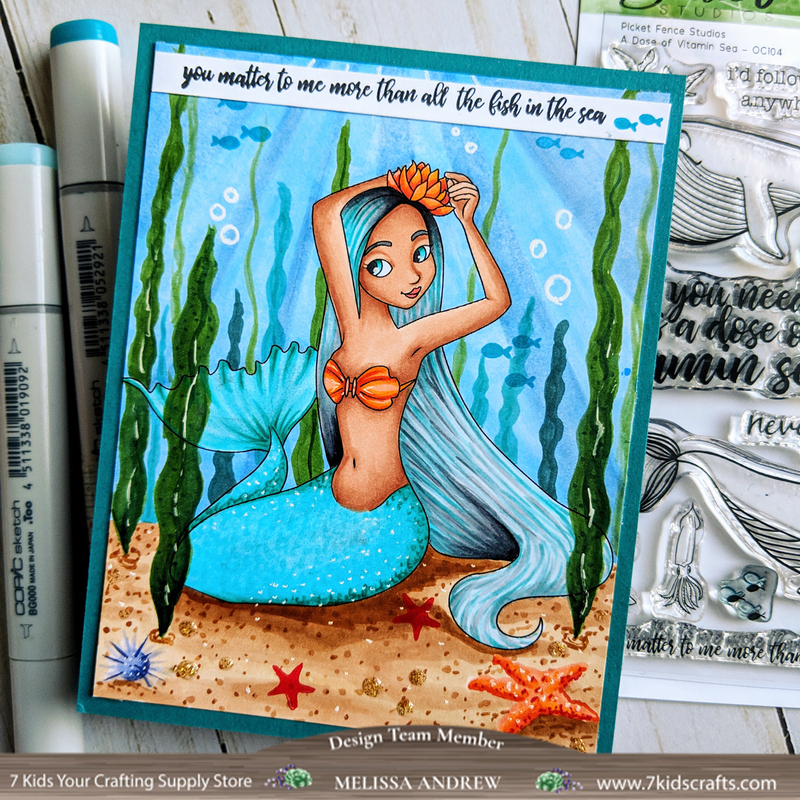 She is fabulous and walks you through each step of Copic coloring. Have you gotten a chance to see the new digital images at 7 Kids from Red Hibiscus Designs? They are simply gorgeous! I've used Flower in a Jar. I colored them in Copic first. I then fussy cut the image. I decided to add some beautiful sparkle with the new Shimmer Stix from Imagine too. I love the control and the amount of sparkle you get with these stix. They are AMAZING. 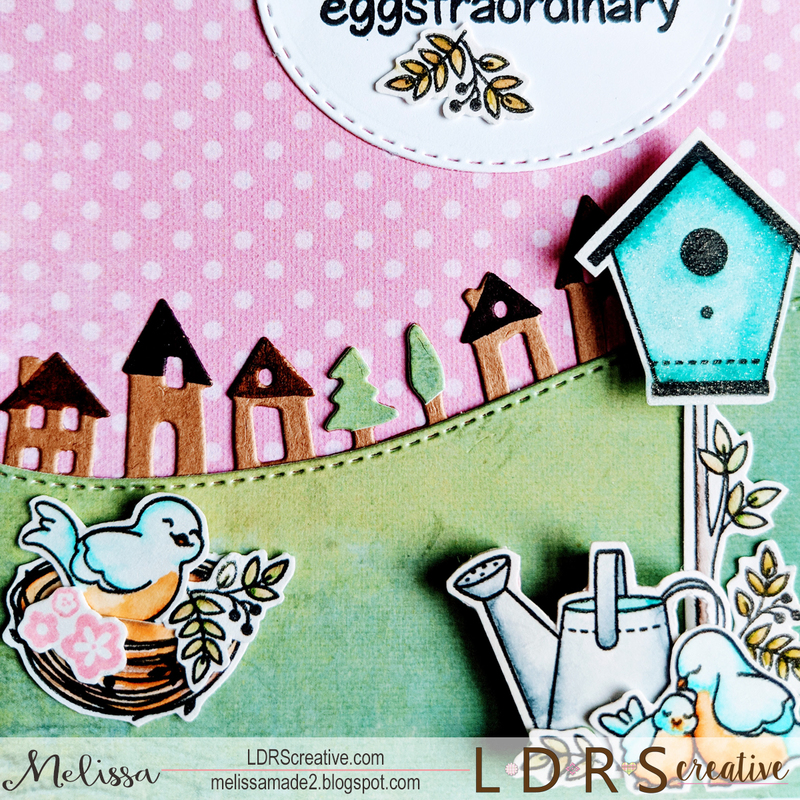 I then used my Whimsy Stamp dies to cut out some layers. 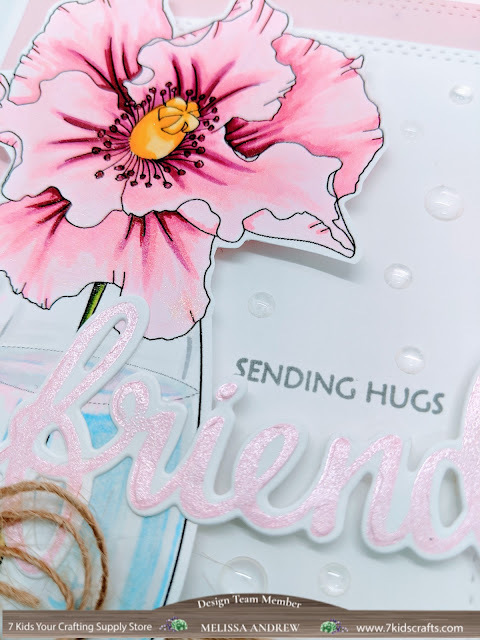 I used pink Shimmer Delicata ink to stamp my LDRS Creative If Friends Were Flowers sentiment and dies. I then stamped the sending hugs in Morning Mist Versafine Clair. Added some twine and placed everything on an A2 sized card! I love the soft pinks and this gorgeous image. Join us at 7 Kids Customer Create for more gorgeous projects! Hi ya everyone! 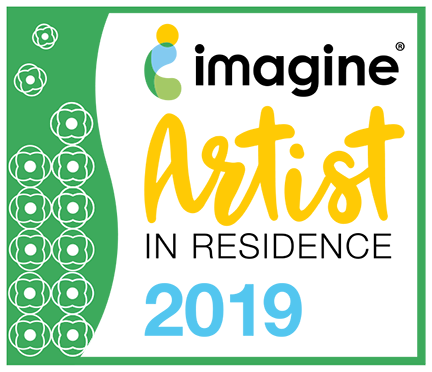 This month at Imagine we were asked to create projects for weddings! All I could think was simple. 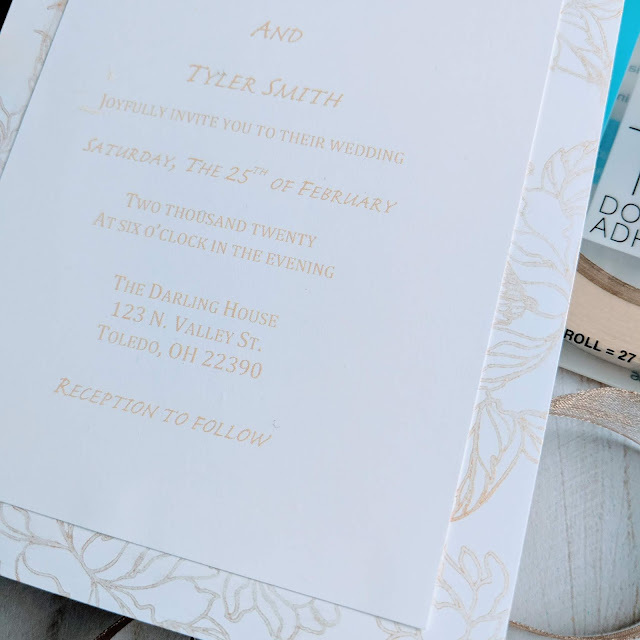 Making your own invitations is a big job, but making it simple and inexpensive is the way to go! Check out my video for inspiration and see how I created these simple and beautiful wedding invites. Hi ya everyone! I created this card on the 7 Kids Customers Create page with everyone on Saturday evening. We had a lot of fun choosing colors and images for this adorable card using the I Wish We Could Hug set from Picket Fence Studios. They are vendor of the month at 7 kids and that means DISCOUNT! I started by coloring this little guy in Copic and then using the Catherine Pooler Fiesta Blue ink to ink the background with a Catherine Pooler stencil. I love how this little guy turned out. I hope you'll join us at 7 Kids Customer Create Page and show off your beautiful creations! There are also games and lots of fun all the time! Can't wait to see you there. Hi ya everyone! I want to share a fun card I made using some seriously awesome LDRS Creative products. First, I love the Key Lime Hybrid ink with the Bali Blue hybrid ink. I'm going to tell you how I did it in a step out tutorial. First, I took white yardstick and inked it with the Playful Patterns stencil and the Key Lime Pie Hybrid ink. Once inked, I cut the paper with the new Sweet Border Village Duos die as seen above. I then inked a sheet of white card cut to 4 x 5.25 inch with Bali Blue Hybrid Ink for a sky! This is such a gorgeous blue perfect for any sky. Next, I inked up my mountains and treeline stamp set with the Raven Hybrid Ink and stamped them onto paper so I could color with alcohol markers. Once colored, I used the mountains die and treeline die to cut out both. Next, I stamped the balloon, car and road from the Going Places stamp and die set. I colored all of these in my alcohol markers as well. Then die cut the road with the coordinating die! I love this adorable set! It's so fun to have the die with the stamp set for ease. Last, I assembled my card. I centered the bali blue card on an A2 base. I then placed my mountains and trees on top of that. I then added a key lime striped paper to the top of my mountains and trees shifted down a bit. I added the road cut-out popped up to that. Last, I used my last piece of key lime strip paper to the top as seen above. 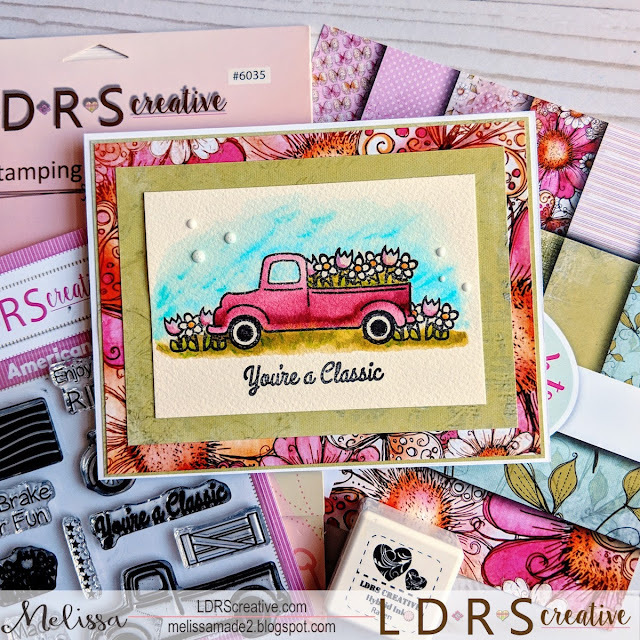 I added the car and balloon to the sky and placed some enamel dots for decoration. I added the sentiment last with the Raven Hybrid Ink from the Going Places set. I absolutely love how this card turned out. It was so fun to layer each piece to create a gorgeous scene! 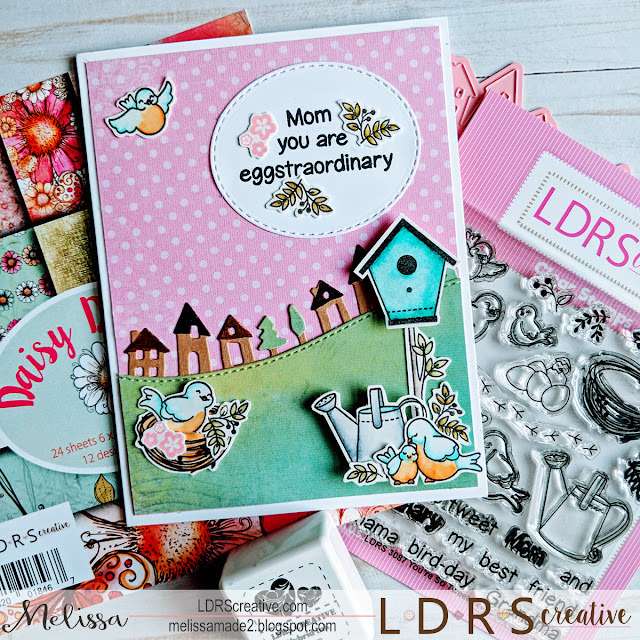 You'll love how these stamp sets work so well together to create fun backgrounds. Make sure to join us again for more great tutorials and inspiration. You can also find LDRS Creative on Instagram, Facebook and YouTube! 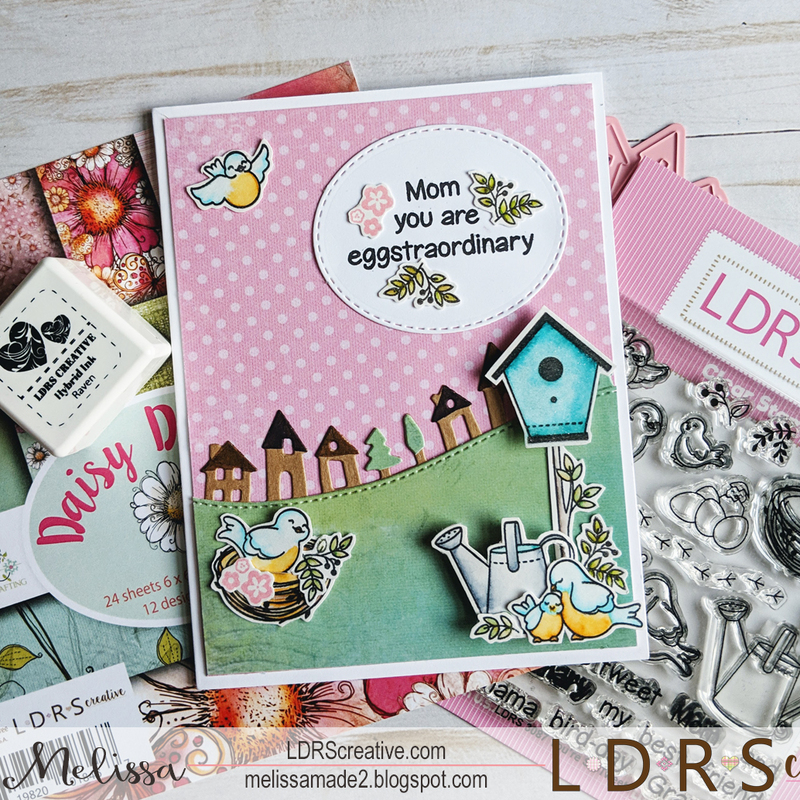 Don't forget to stop by the shop and get all the latest stamps, dies, ink and more! No Lion - You're the Best! Hi ya everyone! 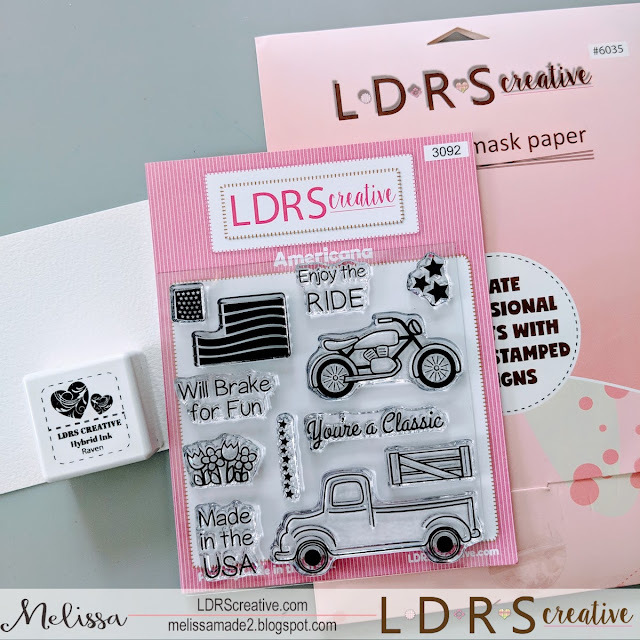 7 Kids has a fun little card kit for sale right now that I just love. 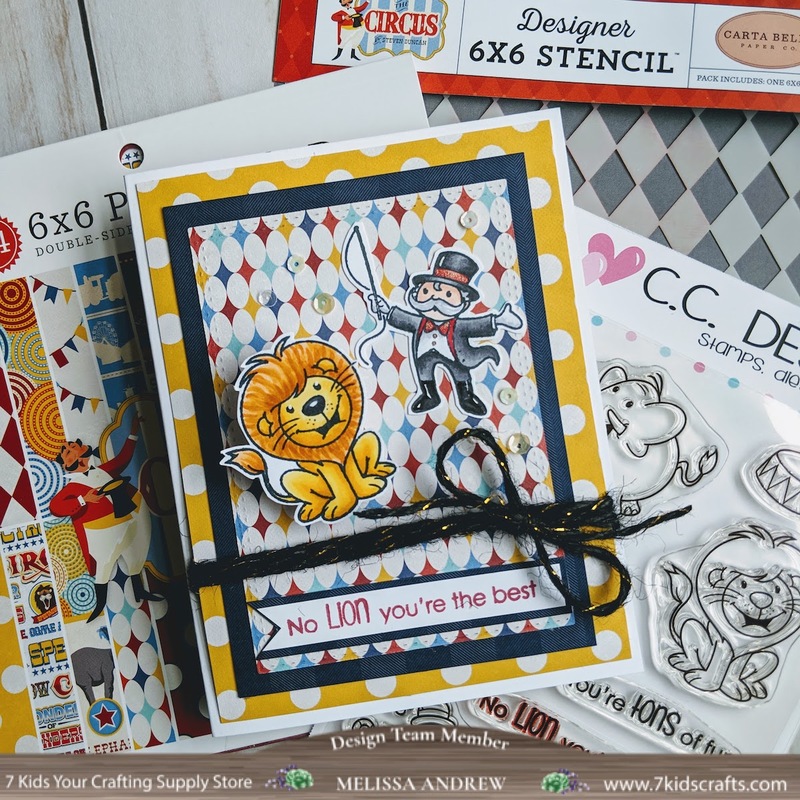 It comes with a wonderful 6x6 pad of paper from Carta Bella, a red novo marker, a diamond stencil, a clown stamp set, the black twine you see and those adorable yellow sequence...oh and little chipboard. All kinds of goodies for you to experiment with. 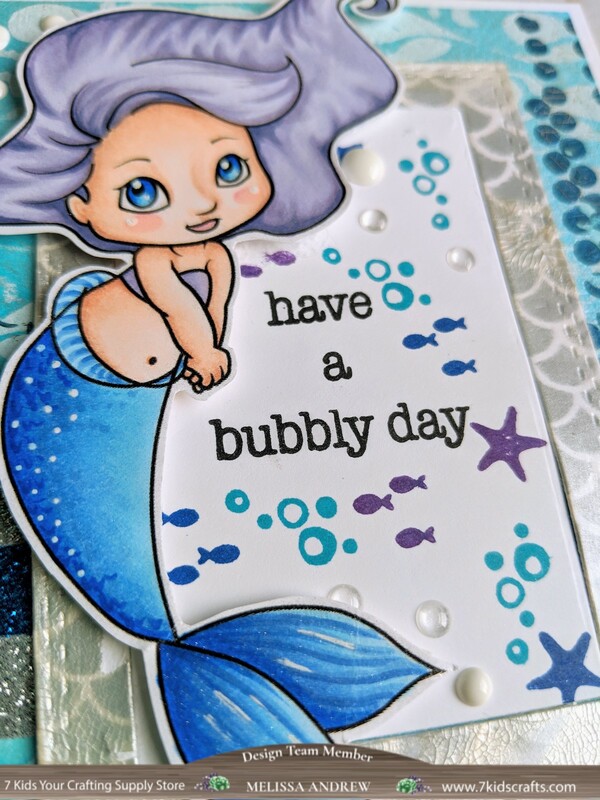 I made this card with that kit using a different set of stamps from C.C. Designs. 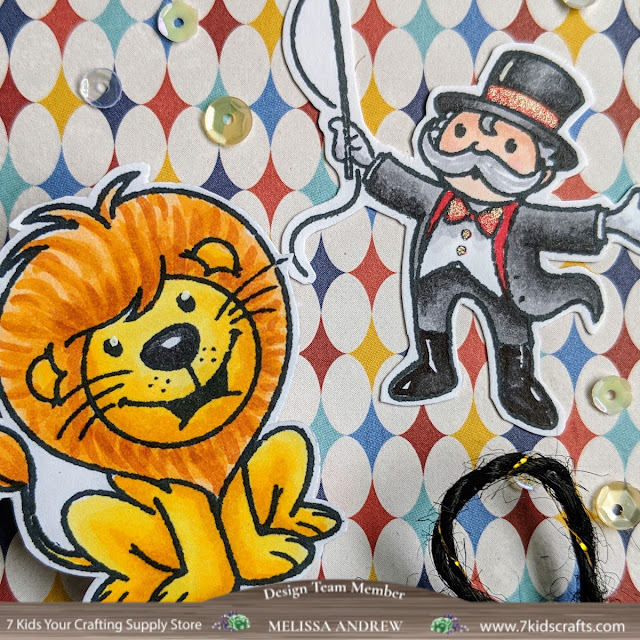 I colored the little lion and master in copics. I paired them with some adorable paper and added the twine and sequence. So easy and so much fun. I love this fun circus card kit. Customer Create Live with 7 Kids! Hi ya crafty friends! This card was created on a Saturday night Facebook Live at 7 Kids Customer Create. I, along with a number of fabulous crafters, sat around and created this card together. It was so much fun to get other's thoughts and opinions as I created. We chose paper together, an image together and colors together! You should join us as this group is a blast. 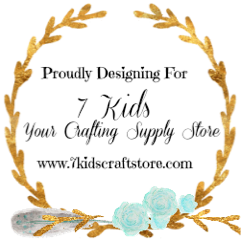 There are freebie digital images by the wonderful Amy Young. Leah and Kelly both have mixed media LIVE facebook feeds! If you want to watch step by step how a community created this card together, come no over to 7 Kids Customers Create! Hi ya everyone! 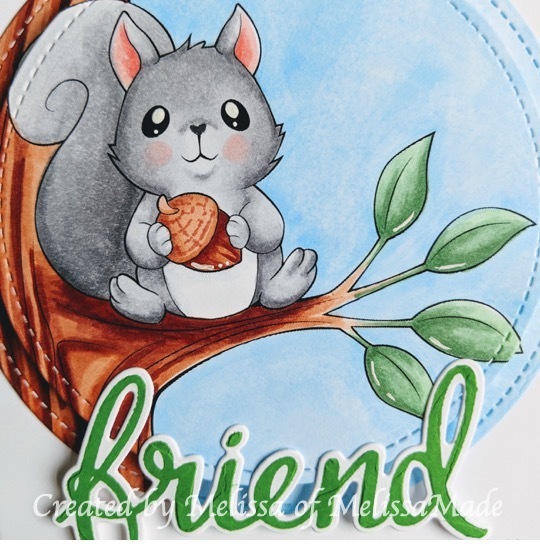 I'm sharing a cute digital image with you today from SweetEscapeDigis called Nuts About You. I colored him in Copics first and did so simply. Once I was finished I used my Lawn Fawn Stitched Circle Dies to double cut the image. I then used my LDRS Creative stamp set If Friends Were Flowers stamp and die set for the friend sentiment and the sentiment below. I used the Catherine Pooler Grass Skirt ink (this is the first time I've used it, and I have to say, I love it!) I popped up the top circle on the center of a die cut rectangle. Then adhered the larger circle with glue lower. 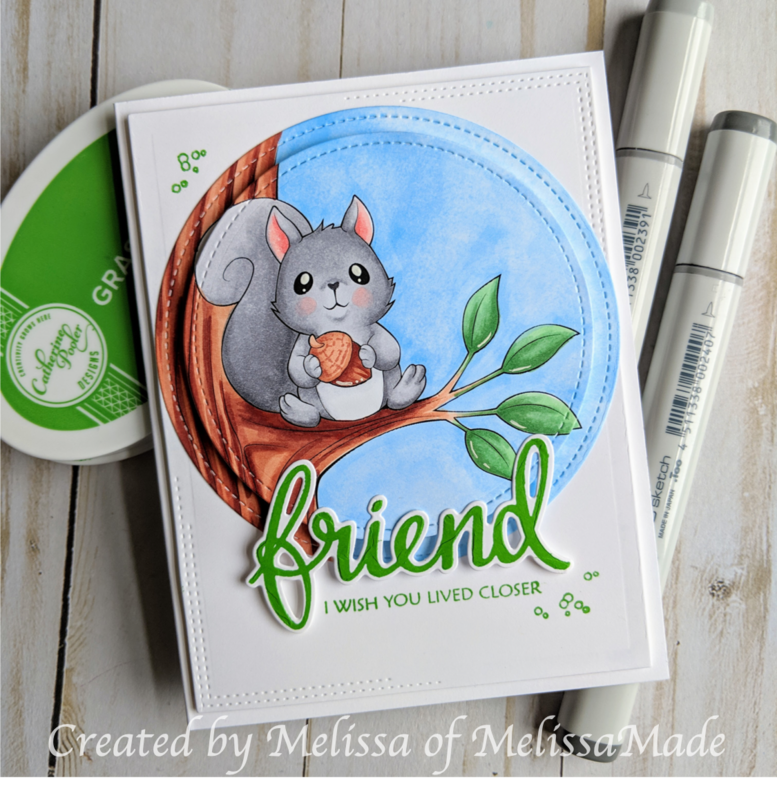 Adhered the friend sentiment and stamped the I wish you lived closer in the same green ink. Make sure to check out all the wonderful digs at SweetEscape! I'm excited to share a simple masking tutorial with you today using the new stamp set Americana. 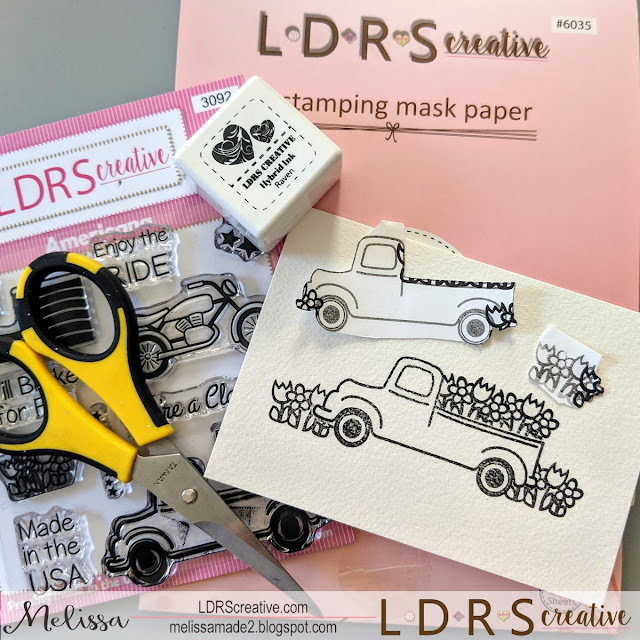 I started with the following products from LDRS Creative: Raven Hybrid Ink, Americana stamp set, and Masking Paper. I also used watercolor paper, a stamping platform and scissors. 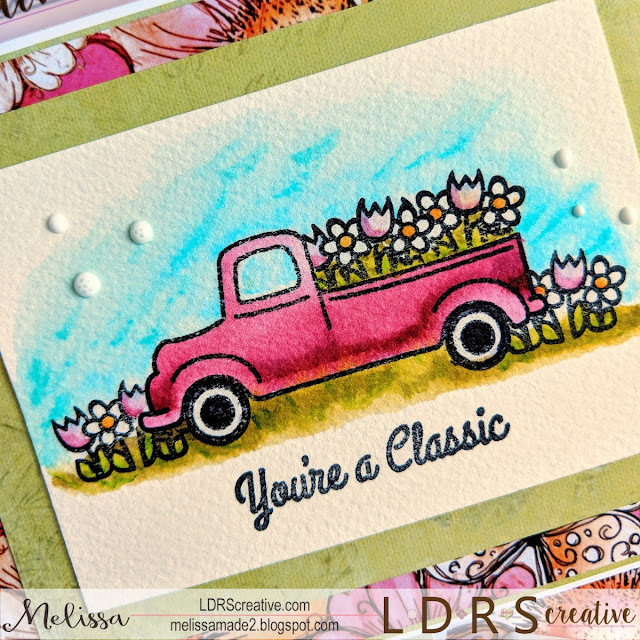 I stamped the truck and sentiment first in the Raven Hybrid Ink. I then stamped onto the masking paper the truck and the flowers so I could put them in the back of the truck and around the sides of the truck. I then cut out the masks, especially around those places I knew I would need the mask. I placed the mask over the truck and stamped my first set of flowers close to the cab of the truck. Next, I covered the first stamped set of flowers with a mask and stamped right next to it. I then repeated this process until the back of the truck was filled. I also stamped once in front and in back of the truck with the flowers, again over the truck mask. Once this was stamped, I added the sentiment. I used a stamping platform because the watercolor paper is quiet textured and a platform allows for repeated stamping. I didn't mind the rustic look though since the classic truck is an oldie but goodie. I then colored my scene with watercolor markers and a watercolor brush. Last, I chose beautiful papers from the Daisy Delights 6x6 paper pad. What a beautiful set of papers! I chose a green and a floral piece that matched my truck and watercolor scene. I mounted the watercolored truck on a piece of green, then layers that on the floral. I then added it to an A2 sized card. I hope you enjoyed my step by step process. Today, I've used the BEAUTIFUL Ruby Celebration stamp. I loved pairing her with the new die Petalette. 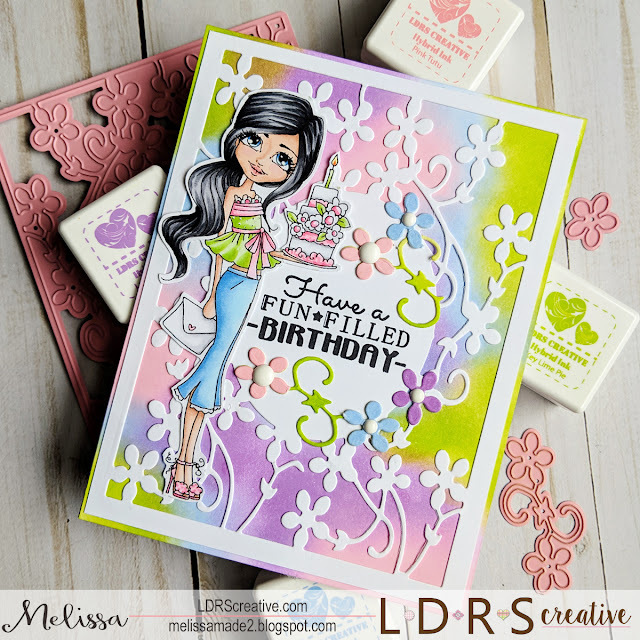 This die is so wonderful as you can add extra flowers to the top for more dimension! 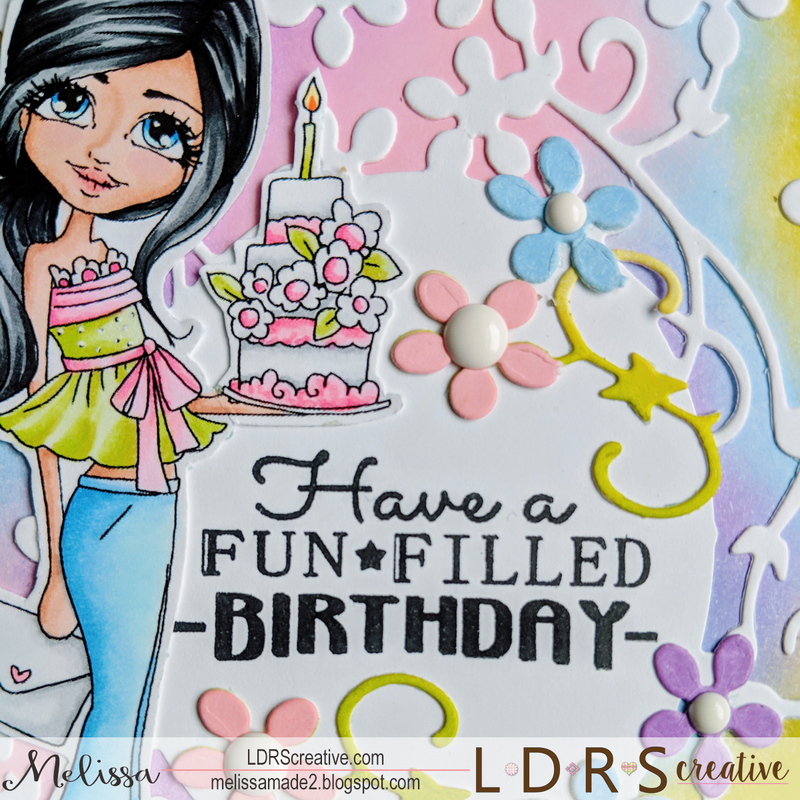 I stamped Ruby in Hybrid Ink Raven and colored her in my alcohol markers in matching colors to LDRS Creative Hybrid inks in Key Lime Pie, Swimming Hole, Lulu Lavender, and Pink Tutu. You guys, have you had a chance to check out the new images that 7 Kids has currently! There are three gorgeous ones you have to check out. I used the beautiful Isla Tidecaller. Isn't she stunning! There is also a wonderful Centaur and a fabulous Fairy! Truly, they are amazing and can be downloaded immediately! I colored her in Copics! 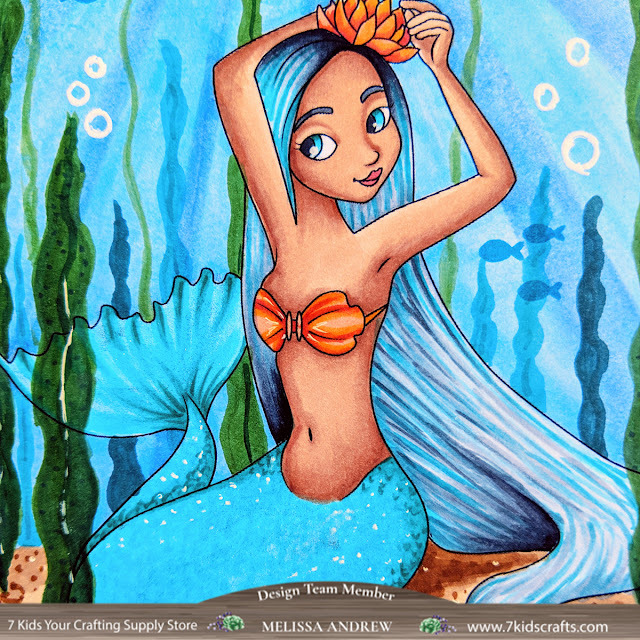 How fun to color that beautiful hair and tail! Next, I used the fun Picket Fence Studios stamp set (which is vendor of the month - which means SALE) to add fish and a sentiment, as well as a few sea stars. Please join our Facebook Customers Create page too for a freebie this month. You won't regret it. The artist of Sweet November has regular color along LIVE on Facebook. Hello everyone! I wanted to share this adorable card I made using the new and sweet Holly - Watch It Grow! Isn't she perfect for spring! I couldn't wait to get my hands on her. She matched so well with the Sincerely Yours 6x6 Paper and the sentiments from the Wordalicious Stamp Set. Join me as I walk you through my simple steps! 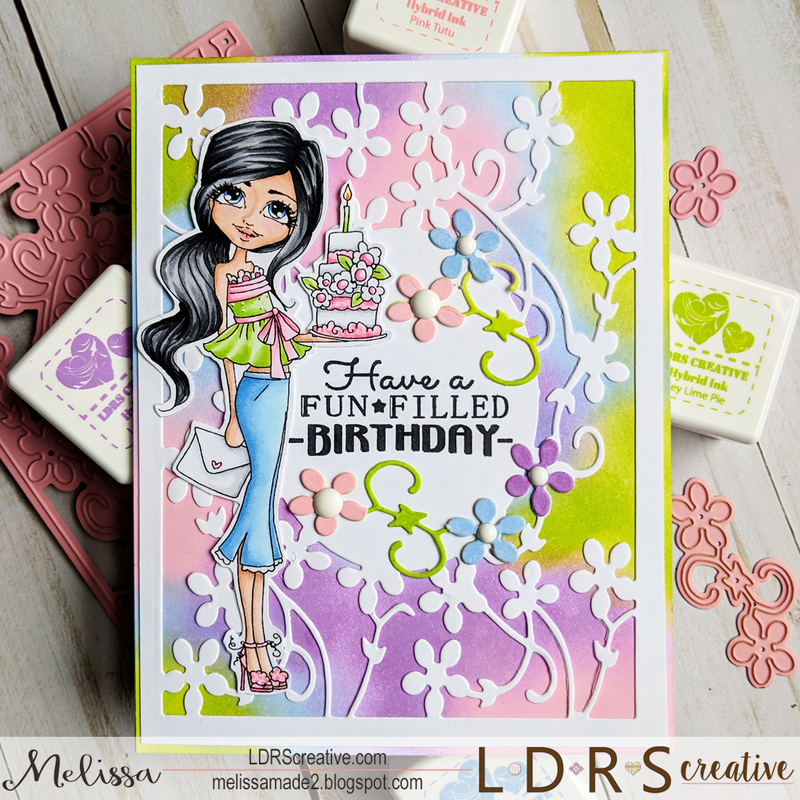 First I stamped her with Raven LDRS Creative Hybrid Ink on white cardstock. I then colored her with alcohol markers. Next, I fussy cut her. I cut a piece of the Sincerely Yours 6x6 paper to 4 x 5.25". I adhered that to an A2 size card base. I then used Holly Circle Wreath Die to cut the circle out of another piece of Sincerely Yours matching paper. Don't you love when your papers from a set coordinate so well? I stamped the sentiment on the circle die, "You Are Wonderific" from the Wordalicious stamp set in Raven Hybrid Ink. I then adhered the circle to the background with foam tape. After, I attached Holly and added a little bling for a finished card. I hope you enjoyed today's simple and fun card using Holly Watch It Grow, Sincerely Yours Paper, Wordalicious stamp set and Raven Hybrid Ink! You can always find more inspiration on Facebook, Instagram and YouTube! 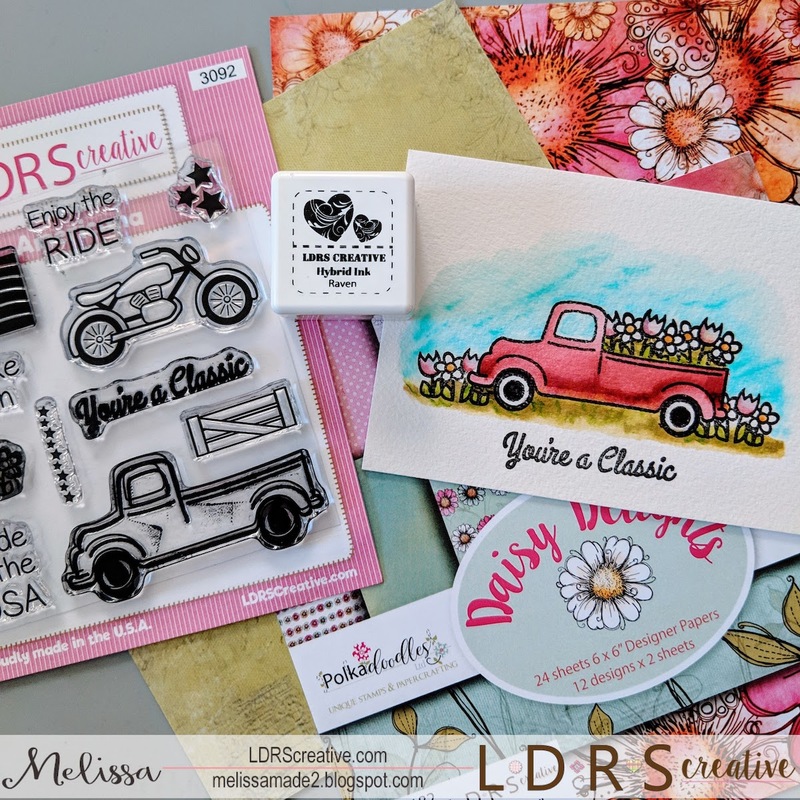 Join us again tomorrow right here for another fun and fabulous project. Hi ya everyone! Quick post today using these adorable foxes from The Greeting Farm called Foxy Fun. 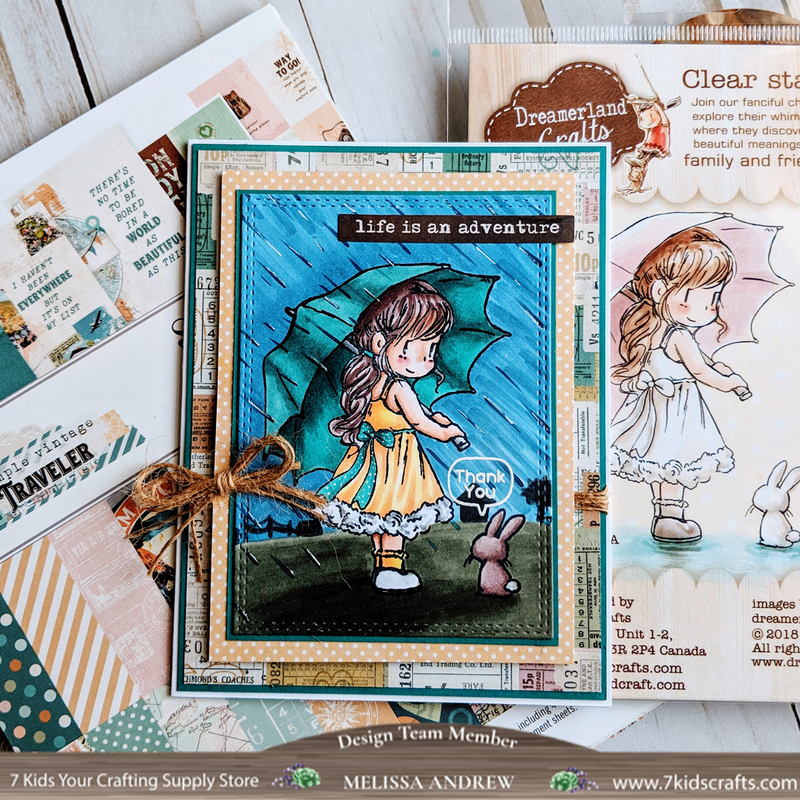 You know, time is running out to get your 20% discount on all The Greeting Farm stamps and Mixed Media products! The sale ends at the end of March...so you better get on it! 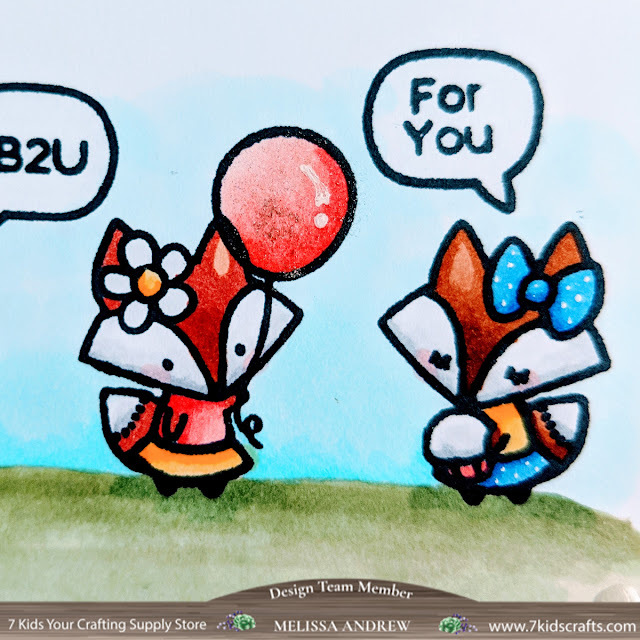 I stamped these cuties in Memento Black ink and colored them with my Copics. I then mounted them on paper from LDRS Creative called Candy Counter. Make sure to head over to the 7 Kids Customer Create page for lots of fun...that is of course after you shop the sale! Today, I'm sharing a short DIY for this adorable card using the new StazOn Pigment Solvent Ink from Tsukineko. You will want to get the beautiful white for sure. It stamps so clear and clean on dark card. I've used a number of white inks, but this is by far! I love it. Check it out below! If you head to YouTube you can find links to all the products I used today, including the StazOn inks. Hello everyone! 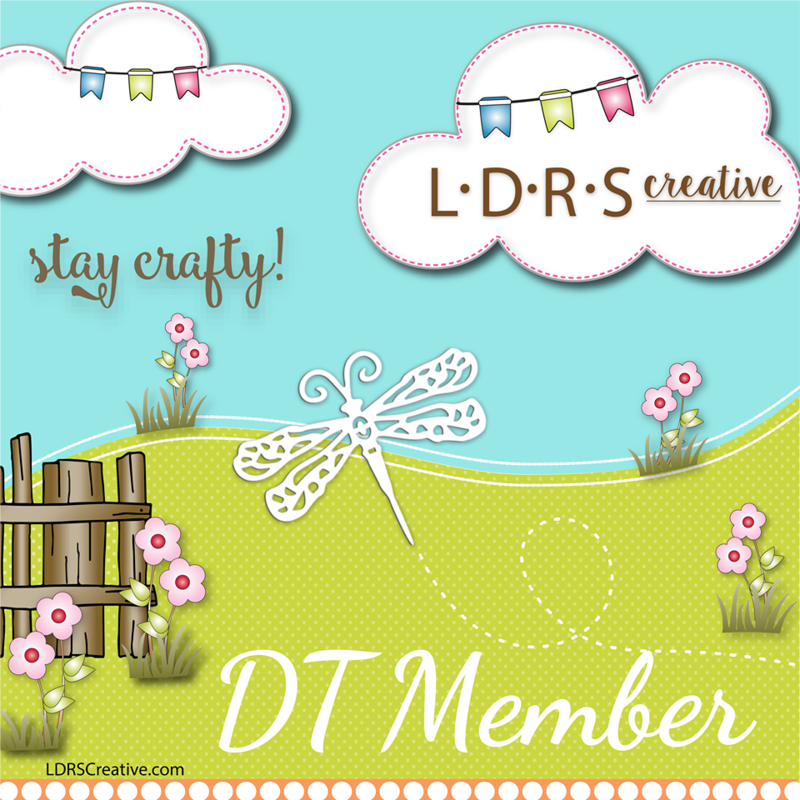 Today, I used the ADORABLE Dreamerland Crafts image from 7 Kids Craft. I think that this one is out of stock, but you guys, there are SO many cuties! You can find all of the here. I colored the whole scene in Copics. Once colored, I die cut the scene with a rectangle die. I then added her to Simple Stories paper called Vintage Traveler. I also added some twine, ephemera from the Vintage Traveler pack, and a The Greeting Farm sentiment from the adorable Foxy Fun. You can still get 20% off right now for The Greeting Farm and for Mixed Media products! Join us on the Customer Create page on Facebook too! There are games and prizes, as well as freebies! Also, Kelly now has in the store a card kit and a mixed media kit!